After reading Norman Winski's debut 'The Hitman' novel, “Chicago Deathwinds”, I decided this series wasn't worth a wooden nickel. 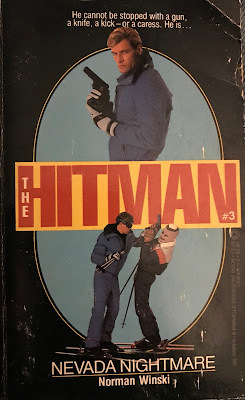 So, like many completely disposable pieces of literature, I'm right back to Winski and 'The (S)Hitman' all over again. Why? I wish I had an answer for this and other perplexing questions like, “Daddy, what's wind really?” Sometimes, Paperback Warriors can't provide all of the answers. 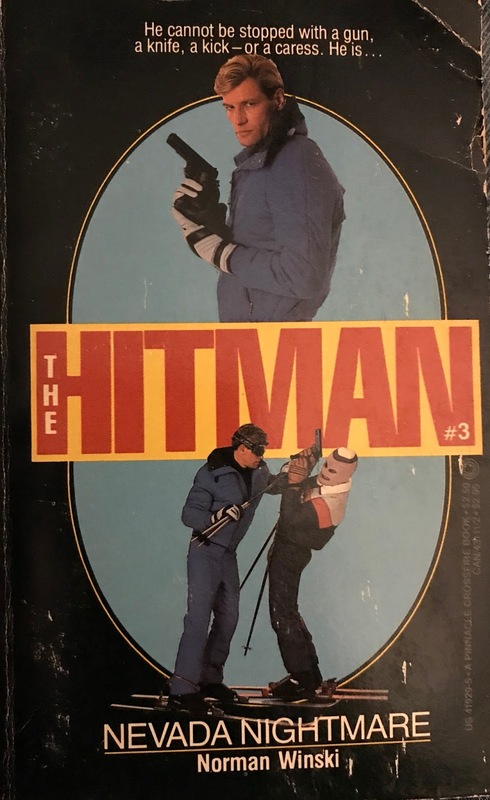 “Nevada Nightmare” is the third and final book in the 1984 series 'The Hitman'. It's not to be confused with Kirby Carr's 1970s series of the same name. I assume poor sales for Pinnacle combined with the decline of the genre in the 80s lead to the killshot for our protagonist Dirk Spencer. While I critically dissected, bashed and wiped the filth from “Chicago Deathwinds”, in retrospect I'd have to ask myself if it was really that bad. “Nevada Nightmare” is an improvement on the series debut, staying more in the pocket with action and plot instead of wasting pages and pages on guns, clothing and location. Winski jerks the curtain with a stage consisting of “Cult Leader Psychopath”, “Damsel in Distress” and “Dirk!” and writes the script with “bang goes cult member 1, 2, 3, etc.”. Look, I'm not buying 'The Hitman' for the photos. Like Ralph Hayes, Dan Schmidt, whoever is writing William W. Johnstone and Jerry Bruckheimer...I just want a lot of man-boom. It's here. Book number two, “L.A. Massacre”, is still MIA from my libraries, but apparently it wasn't anything special. In “Nevada Nightmare”, Dirk reflects on the events of “Chicago Deathwinds” and says nothing about his excursion to Hollywood. Key characters from the series like Tad (Chicago Tribune journalist) and Valerie (reporter, moist hole) are featured in this installment set in the mountains of Nevada. A religious cult psycho named Zarathustra has rose to prominence, built a mountain fortress (called Shangri-la) and recruited 900 clergy men and women to follow his radical extremist footsteps. This lunatic uses cassette tapes to lure his people into trance-like states where he can deem them “Moonchild” before bedding them in his posh penthouse. Dirk gets involved when Zarathustra kidnaps his friend Tad and his daughter Melody. The mission: bang Valerie on autopilot above the Sierras, infiltrate the cult, rescue Tad and Melody, flea to to flea-market obscurity. Oddly, pages 81-83 are step by step instructions on creating napalm. We become curious protegees while watching Dirk make a bomb with aluminum foil, a hairspray bottle and some soap flakes (and more ingredients that I won't provide here). Today's publishing world would never permit this bomb-making tutorial to make print (and probably report the author to authorities), but in 1984 I guess we were all just busy hoping the Cubs would get there. While Winski provides the step-by-step on something like this, I cringed reading, “The .357 Magnum spit 9mm slugs”. Amazing. Equally baffling is Dirk's ability to drive at high-speed on an icy road with a bimbo straddling the driver's seat because she just can't live without Dirk's junk. At the end of the day, Dirk is The Hitman. The guy with all the money, tail and a three-book series dedicated to his “wetwork”.